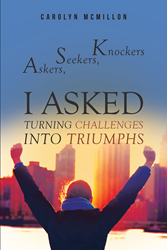 “Askers, Seekers, and Knockers: I ASKED” from Christian Faith Publishing author Carolyn McMillon is a helpful book that provides practical principles for people to become the people they desire to be with dedication to be persistent in making efforts to fulfill their life purpose. “Askers, Seekers, and Knockers: I ASKED”: an inspiring book that presents a step-by-step process for people to reach success in their personal, academic, and professional lives. “Askers, Seekers, and Knockers: I ASKED” is the creation of published author, Carolyn McMillon, a highly acclaimed and dynamic senior leader in the federal government currently serving as an executive member of the SES cadre and the founder, leader, and mentor of ASK, a group dedicated to inspiring others to achieve their greatness. Published by Christian Faith Publishing, Carolyn McMillon’s new book is not a feel-good guide book that shows success as something that can be achieved overnight—it encourages everyone to diligently strive hard to reach their dreams and aspirations. The principles of “Askers, Seekers, and Knockers” are based on McMillon’s observations on the attitude and practices of most successful people. The author herself is also a product of the concepts in her book; bits of her life story is included as a testament that nothing is impossible with the right character and outlook in life. View a synopsis of “Askers, Seekers, and Knockers: I ASKED” on YouTube. Consumers can purchase“Askers, Seekers, and Knockers: I ASKED” at traditional brick & mortar bookstores, or online at Amazon.com, Apple iTunes store, Kobo or Barnes and Noble. For additional information or inquiries about “Askers, Seekers, and Knockers: I ASKED”, contact the Christian Faith Publishing media department at 866-554-0919.